PNNL's new zinc-polyiodide flow battery has a high energy density, which reduces its size and cost and makes it well suited to store energy in densely populated cities. 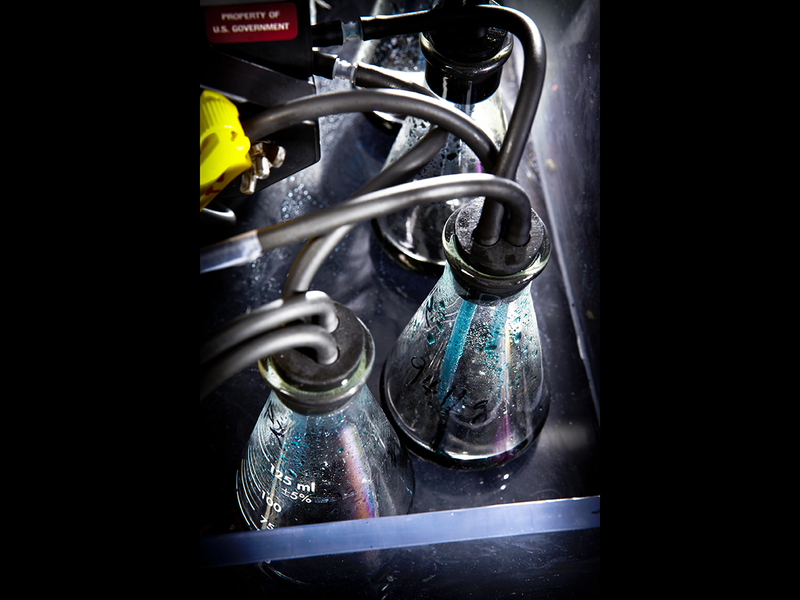 Shown here are electrolytes from another PNNL flow battery, a vanadium-redox flow battery. RICHLAND, Wash. — Ensuring the power grid keeps the lights on in large cities could be easier with a new battery design that packs far more energy than any other battery of its kind and size. The new zinc-polyiodide redox flow battery, described in Nature Communications, uses an electrolyte that has more than two times the energy density of the next-best flow battery used to store renewable energy and support the power grid. And its energy density is approaching that of a type of lithium-ion battery used to power portable electronic devices and some small electric vehicles. "With improved energy density and inherent fire safety, flow batteries could provide long-duration energy storage for the tight confines of urban settings, where space is at a premium," said Imre Gyuk, energy storage program manager at the Department of Energy's Office of Electricity Delivery and Energy Reliability, which funded this research. "This would enhance the resiliency and flexibility of the local electrical grid." "Another, unexpected bonus of this electrolyte's high energy density is it could potentially expand the use of flow batteries into mobile applications such as powering trains and cars," said the study's corresponding author, Wei Wang, a materials scientist at DOE's Pacific Northwest National Laboratory. Both flow and lithium-ion batteries were invented in the 1970s, but only the lithium-ion variety took off at that time. Lithium-ion batteries could carry much more energy in a smaller space than flow batteries, making them more versatile. As a result, lithium-ion batteries have been used to power portable electronics for many years. And utilities have begun using them to store the increasing amounts of renewable energy generated at wind farms and solar power facilities. But the high-energy lithium-ion batteries' packaging can make them prone to overheating and catching fire. Flow batteries, on the other hand, store their active chemicals separately until power is needed, greatly reducing safety concerns. This feature has prompted researchers and developers to take a serious second look at flow batteries. Flow batteries produce power by pumping electrolytes - liquid solutions with dissolved chemicals — from external tanks into a central stack. PNNL's new zinc-polyiodide flow battery's electrolytes carry positively charged zinc ions and the negatively charged ions iodide and polyiodide. Like other flow batteries, the zinc-polyiodide battery produces power by pumping liquid from external tanks into the battery's stack, a central area where the liquids are mixed. The external tanks in PNNL's new battery hold aqueous electrolytes, watery solutions with dissolved chemicals that store energy. When the battery is fully discharged, both tanks hold the same electrolyte solution: a mixture of the positively charged zinc ions, Zn2+, and negatively charged iodide ion, I-. But when the battery is charged, one of the tanks also holds another negative ion, polyiodide, I3-. When power is needed, the two liquids are pumped into the central stack. Inside the stack, zinc ions pass through a selective membrane and change into metallic zinc on the stack's negative side. This process converts energy that's chemically stored in the electrolyte into electricity that can power buildings and support the power grid's operations. To test the feasibility of their new battery concept, Wei and his PNNL colleagues created a small battery on a lab countertop. They mixed the electrolyte solution, separating a black zinc-polyiodide liquid and a clear zinc-iodide liquid in two glass vials as miniature tanks. Hoses were connected between the vials, a pump and a small stack. They put the 12-watt-hour capacity battery — comparable to about two iPhone batteries — through a series of tests, including determining how different concentrations of zinc and iodide in the electrolyte affected energy storage. Electrical capacity is measured in watt-hours; electric cars use about 350 watt-hours to drive one mile in the city. The demonstration battery put out far more energy for its size than today's most commonly used flow batteries: the zinc-bromide battery and the vanadium battery. PNNL's zinc-polyiodide battery also had an energy output that was about 70 percent that of a common lithium-ion battery called a lithium iron phosphate battery, which is used in portable electronics and in some small electric vehicles. Lab tests revealed the demonstration battery discharged 167 watt-hours per liter of electrolyte. In comparison, zinc-bromide flow batteries generate about 70 watt-hours per liter, vanadium flow batteries can create between 15 and 25 watt-hours per liter, and standard lithium iron phosphate batteries could put out about 233 watt-hours per liter. Theoretically, the team calculated their new battery could discharge even more — up to 322 watt-hours per liter — if more chemicals were dissolved in the electrolyte. PNNL's zinc-polyiodide battery is also safer because its electrolyte isn't acidic like most other flow batteries. It's nearly impossible for the water-based electrolyte to catch fire and it doesn't require expensive materials that are needed to withstand the corrosive nature of other flow batteries. Another advantage of PNNL's new flow battery is that it can operate in extreme climates. The electrolyte allows it to work well in temperatures as cold as -4 degrees Fahrenheit and as warm as +122 degrees. Many batteries have much smaller operating windows and can require heating and cooling systems, which cut into a battery's net power production. One problem the team encountered was a build-up of metallic zinc that grew from the central stack's negative electrode and went through the membrane, making the battery less efficient. Researchers reduced the buildup, called zinc dendrite, by adding alcohol to the electrolyte solution. Managing zinc dendrite formation will be a key in enabling PNNL's zinc-polyiodide battery to be used in the real world. Wei and his colleagues will continue to experiment with different alcohols and other additives and use advanced instruments to characterize how the battery's materials respond to those additives. The team will also build a larger, 100-watt-hour model of the battery for additional testing. Researchers characterized the new battery's chemical interactions using a variety of advanced instruments — including nuclear magnetic resonance, Raman spectroscopy, mass spectroscopy and more — at EMSL, the Environmental Molecular Sciences Laboratory, a DOE Office of Science national user facility at PNNL. This research was funded by the Department of Energy's Office of Electricity Delivery and Energy Reliability. Reference: Bin Li, Zimin Nie, M. Vijayakumar, Guosheng Li, Jun Liu, Vincent Sprenkle, Wei Wang, "Ambipolar Zinc-Polyiodide Electrolyte for High Energy Density Aqueous Redox Flow Battery," Nature Communications, Feb. 24, 2015, DOI:10.1038/ncomms7303.